This is a painting about the personification of my home. 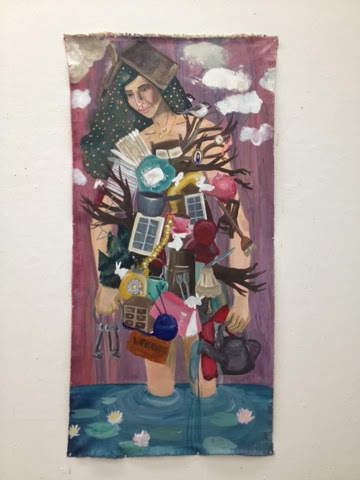 I wanted to create a figure out of the characteristics of my life long home. It was an assignment for school, So it's more rushed than I would have liked. But that's just how it worked out this time. I am referencing Monet's paintings in the bottom portion of the painting. It is not stretched because of limited funds and having to use public transit (people on the bus literally frown when they see me come onto the bus with a large canvas or anything more than a purse) it's easier to transport this way. Next week is reading week. Or for me, sleeping week. Stay tuned for more art and cool stuff.